Home to the Lytton family since 1490, this spectacular country house boasts stunning architecture and a vibrant history. You will notice on arrival that Knebworth’s exterior showcases plenty of gargoyles, turrets and domes. This Victorian façade hides a much more ancient history as it conceals a red brick Tudor house. One of the most extraordinary things about this stately home is its mixture of styles and period features. Each generation of the Lytton family made a change to the house and so it consists of a collage of 500 years worth of alterations and additions. It isn’t just the outside of the building that is so impressive, however. The interior holds many treasures and makes a trip to Knebworth extremely exciting and informative. Make sure you spend some time in the Banqueting Hall, the oldest room in the house. Edward Bulwer Lytton said when he entered this hall that “The character of the house was in itself a romance.” This just about sums up the astonishing interior décor and the personality exuded in every room. Once you’ve explored the house to your heart’s content (you can easily spend hours looking around! ), the gardens are a delightful place to get some fresh air. 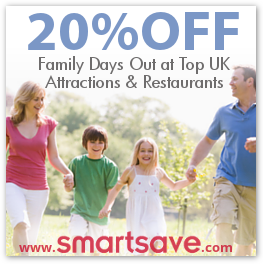 In the 25 acres of beautiful outdoors you will find the ever popular Maze, the Herb Garden and the Dinosaur Garden. This prehistoric exhibition is the perfect place to take the kids for some really big excitement. With its 72 life-size dinosaurs, it really is a spectacular permanent exhibit. Beyond the gardens you will find Knebworth Park, all 250 acres of it. It is the ideal place to take the dog for a walk or sit in peace with a picnic. The adventure playground is great for the kids to let off some steam and for tired legs afterwards, the miniature railway offers a fun and relaxed experience. 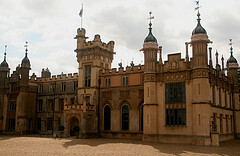 There is so much to see and do at Knebworth House that you’ll never be bored and you’ll want to return time and again. So don your history caps and walking boots and let the adventure begin! Opening Times: Park, Gardens, Dinosaur Trail, Adventure Playground & Tea Room 11am-5pm. House 12pm-5pm (last ticket sold at 4:15pm).